The model painted like its prototype TEP70-0474 at September 2009, when it works at Kotlas depot of Northern railroad. 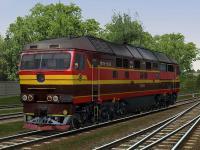 USING THIS DIESEL LOCOMOTIVE TEP70 ON ANY OTHER SITES WITHOUT PERMISSION OF AUTHORS AND ADMINISTRATORS IS PROHIBITED! ATTENTION! FOR CORRECT USING OF THIS LOCOMOTIVE YOU NEED TO DOWNLOAD CABVIEW 8 FOR TEP70 AND SOUNDS 2 FOR TEP70! The model painted like its prototype TEP70-0398 at May 2011, when it works at St.Petersburg-Warshavsky (TCh-14) depot of October railroad. ATTENTION! FOR CORRECT USING OF THIS LOCOMOTIVE YOU NEED TO DOWNLOAD CABVIEW 5 FOR TEP70 AND SOUNDS 2 FOR TEP70! The model painted like its prototype TEP70-0560 at September 2010, when it works at Ivanovo depot of Northern railroad. ATTENTION! FOR CORRECT USING OF THIS LOCOMOTIVE YOU NEED TO DOWNLOAD CABVIEW 9 FOR TEP70 AND SOUNDS 2 FOR TEP70! The model painted like its prototype TEP70-0568 at August 2011, when it works at Ivanovo depot of Northern railroad. IT'S NECESSERY USING TEP70 LOCOMOTIVES! The model painted like its prototype TEP70-0135 at 2004, when it works at St.Petersburg-Warshawsky (TCh-14) depot of October railroad. Отдельная благодарность Раулю Петерсону (Raul) за помощь в подготовке модели. ATTENTION! FOR CORRECT USING OF THIS LOCOMOTIVE YOU NEED TO DOWNLOAD CABVIEW 1 VER. 1.2 OR NEWEST FOR TEP70 AND SOUNDS 2 FOR IT! ATTENTION! FOR CORRECT USING OF THIS LOCOMOTIVE YOU NEED TO DOWNLOAD CABVIEW 8 FOR TEP70 AND SOUNDS 2 FOR IT!